Looking for a pair of vegan fringe boots to wear? You're in the right place! Here are 7 gorgeous options made from faux suede, faux leather and a few other cruelty-free materials. Let's check out the boots. Fierce day-or-night ankle bootie in chestnut brown faux suede with fringe cascading from the cuff. Has a feminine pointed toe and slender 3" heel. Laces up in front and zips up on the inner side of the boot for an adjustable fit. Offers footbed cushioning for comfortable wear. Advertised as vegan: No, but these boots are advertised as faux suede. Pros: Elegant but fun kicks that can easily transition from daytime to evening wear. These are the kind of boots that perfectly balance relaxed fit jeans. Great for fall wardrobes full of mock turtle necks and corduroy skirts. Cons: Not too many foreseeable issues with these beauties. They might be a little challenging to clean due to all the fringe, but that comes with the territory. Fabulous summer ankle boot with an open back and peep toe construction. Made of black velvet with an embossed floral design. Outer side has a single layer of fringe from the top of the ankle to about an inch from the sole. Has a modern chunky heel and a cushioned footbed. Fastens with an inner side zipper. Pros: Pretty semi-casual booties that could easily become part of your summer uniform. The cutout toes and heels make them nice and breathable. Wear them with a breezy shirt dress or jean shorts. Cons: Depending on how mild your spring and fall seasons are, these may work in cooler weather, but all the openness might get a little chilly. Sassy cowgirl knee high boot with plenty of fringe layered from just below the cuff to the foot. Embellished with a row of alternating rhinestones and silver studs around the cuff. Cuff has a stylish "V" shape in the front and back. Foot has a pointed toe and a comfortable 2" block heel. Lightly padded footbed and rubber outsole lend support and durability. Pull-on design is aided by side tabs to hold onto while you slide your foot in. Advertised as vegan: No. The description says "faux leather." Pros: Vintage-type western boots that get an updated look with crystal details and a refined, ultra feminine shape. Take them line dancing or strolling through the park on a cool spring day. The fringe is brown faux leather on the outside and black on the underside, so you'll get a nice color contrast when you walk. Cons: The western style is fairly specific when it comes to matching your shoes to your outfits. Casual burgundy faux suede ladies' fringed boot that just reaches the ankle. Minimal fringe accents run along the top edge at the ankle and the elastic side panels. Stacked block heel is short so that you can be on your feet all day without discomfort. Design is vegan and eco-friendly. 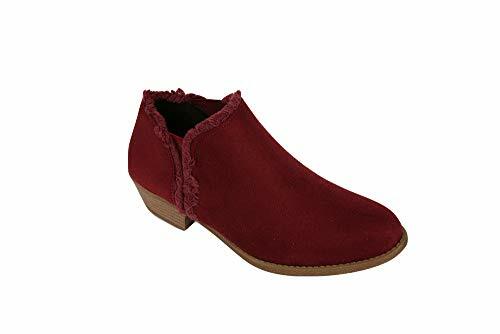 Pros: From the deep burgundy color to the cozy vegan suede, these would make excellent everyday fall boots. Reviewers find them comfortable with a no-fuss heel that can accommodate hours of walking. You'll probably want to wear them with jeans or nice fabric pants, but a good daytime dress will do the trick, too. Cons: They seem to run slightly large. Wedges are in-style. This ankle boot is made of burnished brown faux leather and features tassel-like faux leather fringe knotted into a brass chain across the front. Inner side zipper makes the boot a cinch to take off. Durable rubber sole has a 1" platform and 4" heel. Advertised as vegan: No, but these boots are all synthetic. Pros: Very fashion savvy boots that would look stunning with leggings or with frayed hem jeans. They'd probably do well through most seasons. In fact, they'd be super cute with knit socks peeking over the tops. Cons: They're a wee bit pricey. Ladies' fashion winter boot with a soft, black synthetic upper, a gray faux fur cuff and faux fur with black fringe wrapping around the middle of the leg. Has faux fur pom poms hanging from the outer side of the cuff. Pops with an icy blue panel of geometric patterns around the top. Foot is protected by a waterproof rubber shell. Outsole is made of heavy-duty rubber so you won't slide on the wet snow. Advertised as vegan: No, but the boots are made with man-made materials. Pros: Just because winter is coming doesn't mean you can't wear stylish fringe boots. Pretty and tough — these will get you through rain, sleet and snow. Not too expensive, either. Cons: Perhaps a bit roomy inside, but that might be desirable if you want to wear thick winter socks. 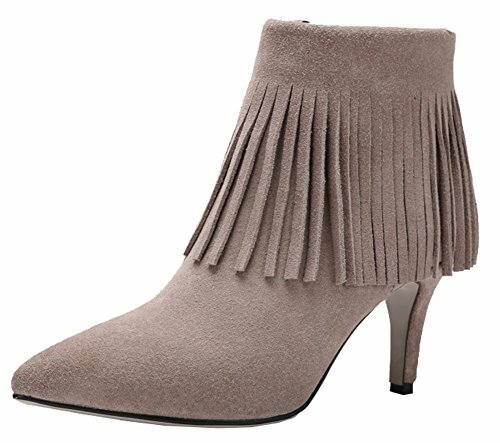 Dressy beige faux suede bootie with a fringed cuff, a pointed toe and a stiletto heel. Fringe is mid-length and hangs to about the middle of the boot. Has an inner side zipper for simplified wear. Slip-resistant rubber sole is steady on the ground. Advertised as vegan: No. These boots are described as faux suede (microsuede). Pros: Dressy beige boots are essential for your closet because they go with any color or clothing type. Whether you want to spice up your office wear or head to dinner with friends, you can wear these any time, day or night. Cons: We're unsure about what sort of inner support these boots have.